So, this may sound a little funny, but I enjoyed reading Dragon’s Oath more than I enjoyed the last House of Night full-length novel. It reminded me about why I’ve stuck with the series for so long. This first in a series of House of Night novellas, is set in the same world as the novels, only a bit earlier. There’s still the same tension between the House of Night schools and the cities they reside in. There’s still magic and love for Nyx. And you get to have all of that without the chaos that currently circles Zoey Redbird in the current novels (see our review of Awakened for details). Instead we get to see Zoey & Co.’s professors Dragon Lankford and Anastasia fall in love. It’s a simple story, told sweetly. Somehow they managed to use poetry in the story again, and, as usual it’s rhyme-y and cheesy, but aside from that the story isn’t cliched. It’s fun to see these two when they were young, and we do get a bit more insight into Dragon’s personality. We’ll better understand his actions at the end of Awakened, and surely what’s to come in the next book. While 95 percent of the book is flashback, the authors decided to open it at a scene from the end of Awakened. After a beloved character has died. If you have not read Awakened, then Dragon’s Oath will spoil it for you — and you will likely be mad. This wasn’t the case for me, but I certainly think a word of warning is warranted. 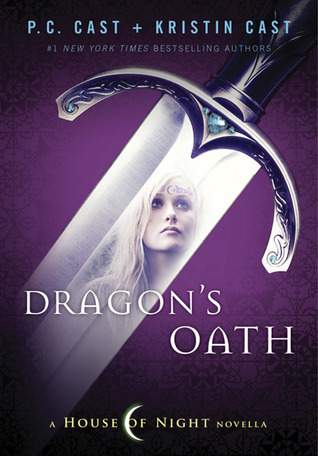 Overall, Dragon’s Oath was a quick, sweet read. It made me smile, and has me more excited to get back to the House of Night full-length novels in the hopes of seeing if Dragon will live up to his promises in the coming titles. I’ve been wondering if I should try House of Night series. After reading the review, it’s on my TBR list. I’m looking forward to reading this. It’s on my TBR List. I did not enjoy the last few HON books as much as I had the earlier ones. I really wish that they would wrap things up. I hate to see a series end but sometimes you have to know when to end it. this book was fantastic and a good read after reading this book makes me want to read the other books in the series. I’m loving it so far…after I’m going to read Hunted. I hear the series gets worse from here– do u agree?